A few months ago, I tried spherification for the first time using sodium alginate mixed with juice, which I slowly dropped into a calcium chloride solution to form tiny, springy, bright orange caviar. It was a tricky process because molecular cooking requires exact ratios and measurements by weight—and any mistakes or miscalculations can result in an end product that is totally unusable. For example, the first time I made this caviar, pictured above, the kombucha-agar solution was slightly too warm and all of the caviar melted together, producing one big blob. For this reason, I find molecular cooking to be a huge challenge, but one that is also the most rewarding at the end if done correctly. This experiment (eventually) yielded a very subtly sweet faux caviar that went well with the saltiness of soy sauce, but the texture here was the most prominent feature—these were silky, soft and smooth and complimented the texture of the rice perfectly. Method adapted from Introduction to Molecular Gastronomy insert included in Molecular Tools by Molecule-R Flavors. Place the rice and water into a rice cooker. While it cooks and steams, combine the sugar, vinegar and salt in a separate glass bowl. Set aside. Pour the oil into a tall beer glass, so it is filled 3/4 full. Place in the freezer to chill for 30-45 minutes. 10 minutes before you take the glass out of the freezer, combine the kombucha and agar in a small saucepan. Whisk until combined and bring to a small boil. Transfer to a bowl and let it cool slightly, until it’s slightly warmer than room temperature. Fill a pipette or squeeze bottle with the kombucha and slowly drop it into the very cold oil. The reason you use a tall glass is so it gives the kombucha a few seconds to firmly gel before it hits the bottom of the glass. To remove the caviar from the oil, pour it over a fine mesh strainer and store the oil to reuse in another application later (this should not affect the taste of the oil). The caviar will be quite sturdy if done properly. Rinse with a little cold water and set aside. Cut the nori sheets into 1 to 1 1/2 inch ribbons. Set aside. 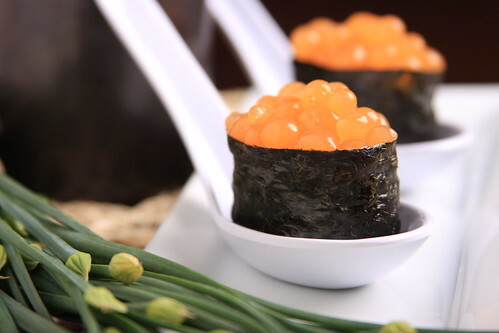 When you are ready to assemble the sushi, place the cooked rice into the glass bowl and combine. Run your hands under some water before handling the rice. Shape the rice into small oval shapes, about the size of your thumb. Then wrap one of the nori strips around that, securing the end with a little bit of water to seal it. Spoon some of the kombucha caviar on the top. Serve with soy sauce. Found your post on tastespotting. Looks absolutely amazing! Thanks for sharing! This is so awesome! When you first described it, I imagined the process being way more involved; I may just have to try this out some time. You should Jackie! Its super-easy, but the temp and timing has to be super exact. I messed up the first two batches and almost gave up, but its pretty cool when everything goes right. Wow. I'm totally humbled. That's a work of art. And science! You're so talented! I'm extremely envious of your skill in the kitchen! 🙂 Obviously they're made completely differently, but how do these compare to the beet caviar? Would you recommend one over the other if making sushi to serve to an omnivore? Just made this using beetroot juice to make beet caviar for blinis – worked AMAZINGLY well! Such a brilliant idea. Happy New Year! What a fantastic idea to use this technique to serve with blinis! Thanks for trying it out, Russell! I know this is a very old post, but I have tried making “caviar” and like you, failed both times, so packed it away…partly because the package says to serve immediately. When I entertain, I don’t want to be making theses last minute. Have you found any time frame on keeping them before serving? Kate, you’re right, it’s been a really long time since I made this, but I think that as long as you store the beads in oil and keep it chilled, it should keep for at least a day. After that, it MAY be fine, or it may start to disintegrate. This has reminded me that I should give this a try again!